Adding easy-to-use, dial-in grade capability to the dependability of the Zone40 H core, this laser is more flexible in use and enables semi-automatic grade in leveling applications. The Zone60 HG is a semi-automatic laser. Semi-automatic means that the laser self-levels only when in level mode, not when grade is entered. Once the Zone60 HG has leveled, the head will start rotating and the Zone60 HG is ready for use. 30 seconds after the Zone60 HG has completed the leveling, the Elevation Alert (H.I.) function becomes active and protects the Zone60 HG against changes in elevation caused by movement of the tripod to ensure accurate work. In grade mode the Zone60 HG checks first the position of the beam at level, and then adjusts to the desired grade input. If a single grade is entered, the cross axis will continue to self-level. 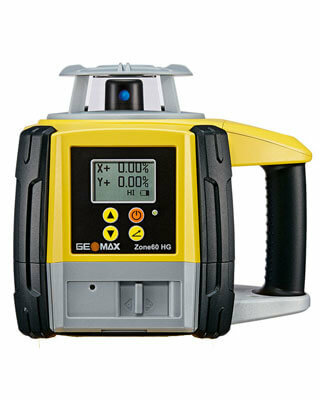 Once the Zone60 HG has reached the desired grade, it does not self-level, but is monitored by Bump Alert and temperature change functions to ensure reliable grade values.